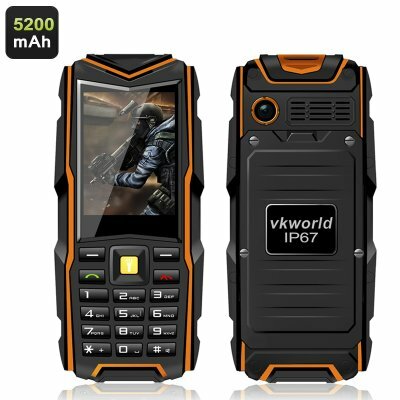 Successfully Added VKworld Stone V3 GSM Phone - IP67 Waterproof Rating, 5200mAh Battery Power Bank, 2.4 Inch Screen Bluetooth (Orange) to your Shopping Cart. This small and simple device is incredibly sturdy and can overcome anything you may have in store for it. Moreover, it comes with a massive battery capacity and will be able to charge up your other gadgets on the go. The 5200mAh battery is more than enough to keep your phone charged for up to 72 hours of continuous usage and offers 360 hours on standby. Featuring IP67 rating, the phone is waterproof for up to 1 meter and is completely dust tight. So, whether you are a fan of water sports or love jogging in the rain, the VKworld Stone V3 will be right there by your side. The phone comes with 64MB of internal memory, but that is easily expandable with an 8GB micro SD card. The 2.4 inch screen is big enough to see all your notifications and messages in comfort and small enough to not be easily damaged. Bluetooth 4.0 also ensures easy and efficient communication with other devices. You will also have 2 SIM cards for stable and convenient communication wherever you are. Very good rigid just see first time we love it. We test according the specification very good product for money.